The GEANT 4 software, developed by a worldwide collaboration, is a dedicated tool for simulation of particle interaction in matter including momentum, energy, and position calculations. The user can implement the detector geometry, including simple as well as more complex shapes and materials, to validate the detector architecture. These simulations are of great interest in the design phase of detectors such as electromagnetic calorimeters for hadronic (DVCS, PANDA) and nuclear physics (EXL/R3B), or a detection system including an HPGe detector surrounded by a BGO scintillator for g-spectroscopy (ORGAM). 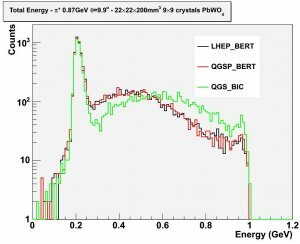 In the framework of the DVCS project (Jefferson Laboratory, USA), we simulated the response of PbWO4 scintillating crystals, enclosed in carbon alveolus for electrons of energy around the GeV. Results show that for certain direction of the incoming electrons, the detection efficiency drops dramatically and that the energy measurement is degraded (see the dedicated rapport). The RDD Department is involved in the R&D phase of the electromagnetic calorimeter for the PANDAexperiment (GSI, Germany). The response of PbWO4 scintillators to incoming pions and electrons was simulated using a simplified geometry following several interaction models provided by the GEANT4 software. For pions, models include the Bertini intra-nuclear cascade which best describes the nuclear interaction of hadrons at energies of a few GeV. This work is part of the feasibility study for the proton electromagnetic form factor measurement with PANDA at FAIR. In Nuclear Physics, detected gamma rays have energies in the range of a few MeV and interact mainly by inelastic scattering, also called Compton scattering. The detector geometry is a crucial parameter for the energy measurement because of the inclusion of Doppler correction for the EXL/R3B (GSI, Germany) calorimeter or for the Anti-Compton rejection efficiency for the ORGAMset-up, which includes HPGe detector surrounded by BGO shields. GEANT 4 simulations helped us defining size and shapes of the detector for both projects.